My Thrifty Thursday series is all about sharing money saving tips I've learned while raising a family under a mountain of debt in half a house. For years we lived on a £50 a week budget (not including housing, bills or travel) while we paid back all of our debts. Now we are able to save for the future because of all the skills learned through those difficult days. Before I go on, in our house we have lunch (at 1pm) and dinner (at 6pm) You may be a dinner & tea, lunch & supper, or tea & supper family, I'm sure you'll figure it out. A meal plan and shopping list - This printable is designed to be printed double-sided then cut the paper length ways, which will give you 2 meal plans with shopping lists on the back. NB. As with all my printables these are free for personal use only, if you want to share them with friends or on your own blog please credit our-handmade-home.com fully. If you steal my stuff I will cry, and you don't want me to cry do you? Making a list of the meals you regularly eat. You only need to do this once and it will make your meal planning much easier. Most of us have a staple of the same half-dozen dinners we cook all the time, with maybe another 20 things we eat occasionally. 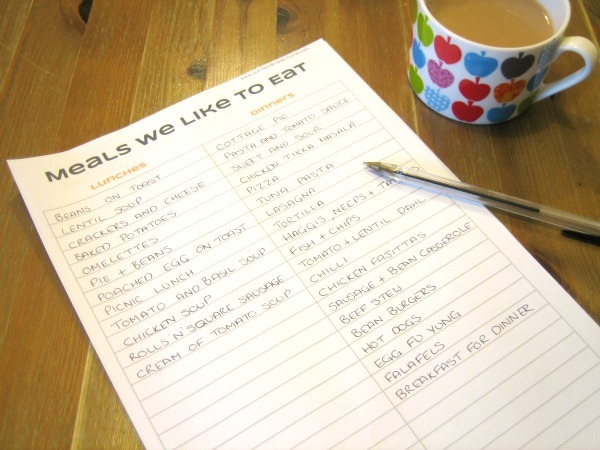 It couldn't be simpler - get a piece of paper (or use our free printable) and write down all the meals you like to eat. Keep your list for future reference. Note down the activities of the week that will affect meal times - Being a family with 2 kids we regularly have after-school clubs, piano lessons, visitors, special events and day-trips. Each week I also make time to cook 1 HUGE pot of food and freeze it in family sized portions - this means I always have a few home cooked 'ready meals' in the freezer for busy days or emergencies. Knowing what you already have. Now it's time to clean out the fridge and pantry - not a deep clean, just a quick wipe and re-order. In the fridge I start on the top shelf move everything down to the lower shelves, give the top shelf a wipe, then move everything up again, tidying as I go and throwing out what will not be eaten. Then I move down to the next shelf, this means I get right to the back and there is nothing lurking, this also means I can stop if I need to change a nappy, answer the door or play candy crush saga. In the cupboard (we have a huge and poorly designed pantry) I just have a look around and a quick tidy, so I know what is there. I usually have a quick look in the freezer, but only clean it out once every 3 months or so. The first time you clean out your fridge and cupboards can be frightening, but just put on your safety goggles and elbow high rubber gloves and get stuck in. When you do a quick clean every week it becomes so easy. Be honest with yourself and throw out the things past their best that have not and will not be eaten. 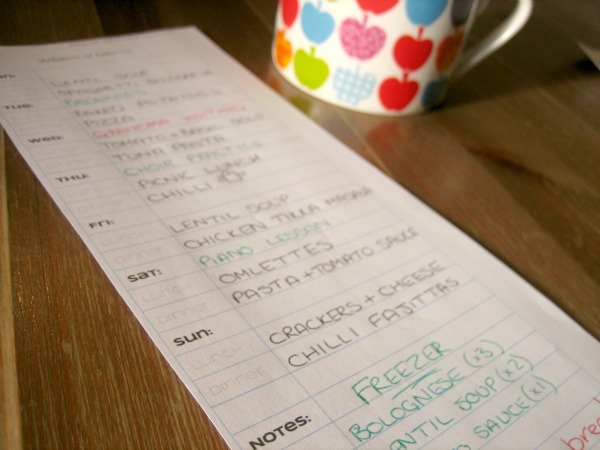 There is space on the bottom of our meal plan printable to note down what you already have. Building a reliable meal plan. 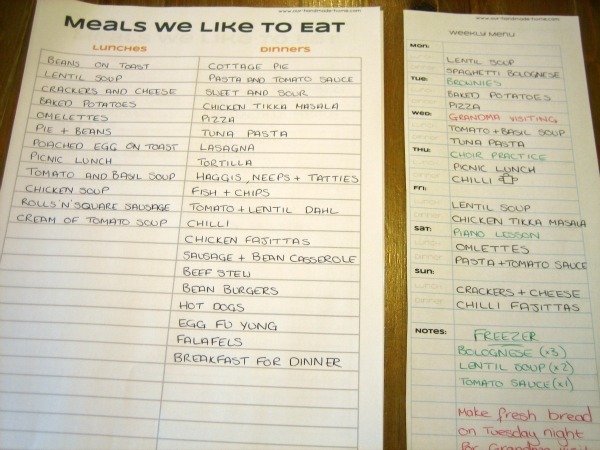 Take all the information you have now and fill in the gaps on your meal plan. On quiet days plan to cook a big pot of something - Friday is quiet for us this week so I'll make Chicken Tikka Masala, it is an all day venture, but makes enough for 3 family meals. If you are out of the house until late plan something in the slow cooker - I make chilli straight after breakfast and it sits in the slow cooker all day, it also makes enough for 3 family meals. Sometimes I'm in the mood for certain things, sometimes I pick things off the list at random, sometimes I try new recipes. Other family members often have requests. Lunches are always more random than dinners. 'Dropping in' to the supermarket costs more money - shops are experts in getting us to buy more than we need. The less time you spend in the shop, the less money you will spend. I'll cover more about shopping lists in a future blog post. The average family in the UK throws out £700 worth of food a year - my entire budget for 4+ months. If you put your mind to it, you could probably feed your whole family for a week on what you already have in the fridge, freezer and pantry. I believe the only reason my family eats well is because we cook everything from scratch. If you buy prepared or ready-meals you'll struggle to keep the costs down. Cooking for Blokes was the book that got me started cooking. For storing homemade 'ready meals' and leftovers, my freezer is indispensable. Get some storage boxes for leftovers. I used to just chuck leftovers in the freezer, and find them 6 months later... 'what is this?'... fast forward 30 mins and we are digging into a plate of curry with spaghetti... hmmm... So I learned the hard way. Either write on boxes with a washable marker or buy inexpensive little stickers and get into the labeling habit. Good meat is expensive. Try planning a few meat-free meals a week. When cooking a meaty sauce (chilli, bolognese, etc) I add plenty of grated carrots, mushrooms, courgettes, etc and a handful of lentils along with a stock-cube to keep that meaty flavour. That's me signing off for this week - Feel free to share in the comments any of your own top-tips for meal planning.